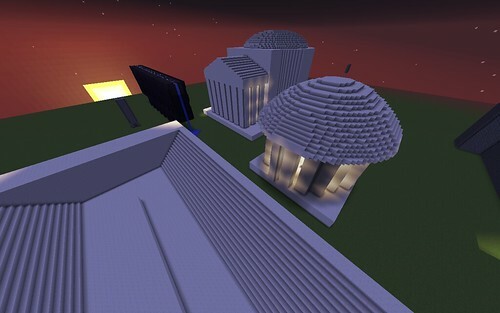 I’m serving as a “Minecraft Consultant” to our 6th grade Social Studies teacher (Sara Zedlitz) and middle school librarian (Michaela Freeland) who are collaborating for a second year on an awesome 3D design and 3D printing project that is part of a study on ancient Rome and Roman structures. Yesterday I helped students who had designed their 3D structures in Tinkercad export their files as “schematics” for Minecraft. Today I used MCEdit to import those objects into a flat Minecraft world and add some modifications to them, including lighting and water in the aqueduct. 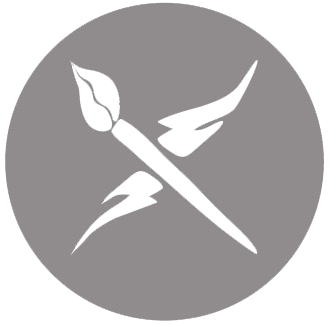 In this post I’ll highlight the key steps of this process and share both a Google Doc how-to document as well as a 5 minute screencast I recorded of my initial import efforts. 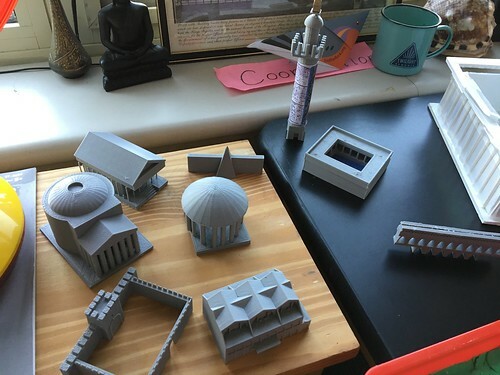 Here is a photo of several of the 3D printed Roman structures which 6th graders designed and manufactured in our library. Note the “rotunda building” with the circular roof in the center. The student had to design it in two parts, with the roof separate, because they could not 3D print together. Several students used this technique of designing and printing objects in several pieces and then gluing them together. 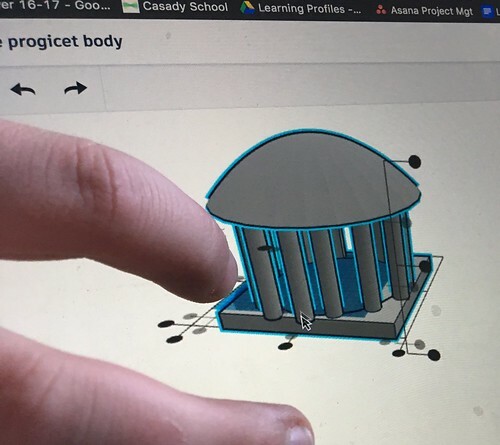 Here is a photo of the student’s design in Tinkercad, with the roof moved on top of the pillars and base. The screenshot below shows the same Roman-style rotunda structure, but lit from inside with glowstone and torches which Rachel (@rachfMC) helped me place after I used MCEdit to put all the structures it in a flat Minecraft world. 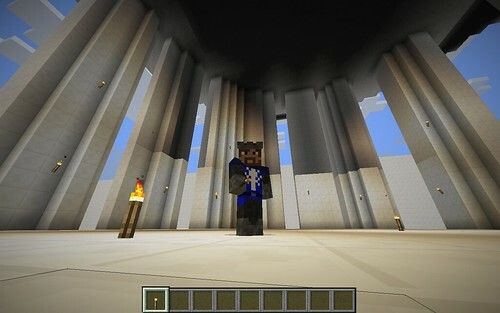 This is a Minecraft selfie screenshot I captured when I was inside the rotunda structure, during the day, before Rachel helped me replace most of the torches with glowstone. Check out this Google Document for step-by-step instructions on how we exported our 3D designs from Tinkercad, I inserted them into a Minecraft world using MCEdit, and then we modified them in Minecraft. MCEdit is tricky to use, and I haven’t yet figured out how to change the scale and size of imported objects. I was able to get all the objects imported into this initial sandbox world, and I REALLY think this is pretty amazing overall. Moving from 3D design on the screen, to a 3D printed plastic object you can hold in your hand, and finally to a 3D virtual object you can explore and modify is wicked cool! I can’t want to share this with our students next week! We’re planning to ask them to collaborate on a narrated tour of their structures, and explain the elements of Roman architecture which they integrated into their designs. 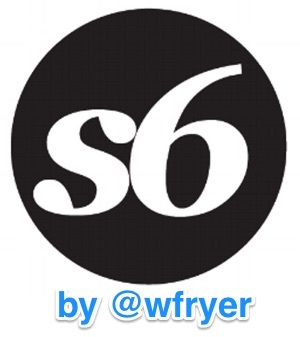 I’ll share that video initially on our school STEM learning Twitter channel (@casadySTEM) and eventually on our school “Learning Showcase” website. For now, check out this five minute screencast showing some of these Tinkercad designed objects in Minecraft. I apologize for the road noise, as I recorded this in the car when my wife was driving. The final narrated tour version we’ll record with students will sound better and have far less background noise! If you watch this video and think this is cool, please let me know by sharing a reply on Twitter to @wfryer or by leaving a comment below. 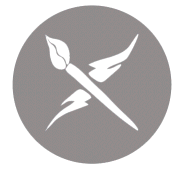 If you’ve done similar projects with students involving 3D design with Tinkercad and Minecraft, please let me know and share any links you have to those projects, blog posts about them, or video screencasts. The Minecraft holodeck is here, and I’m excited to be able to help design it!